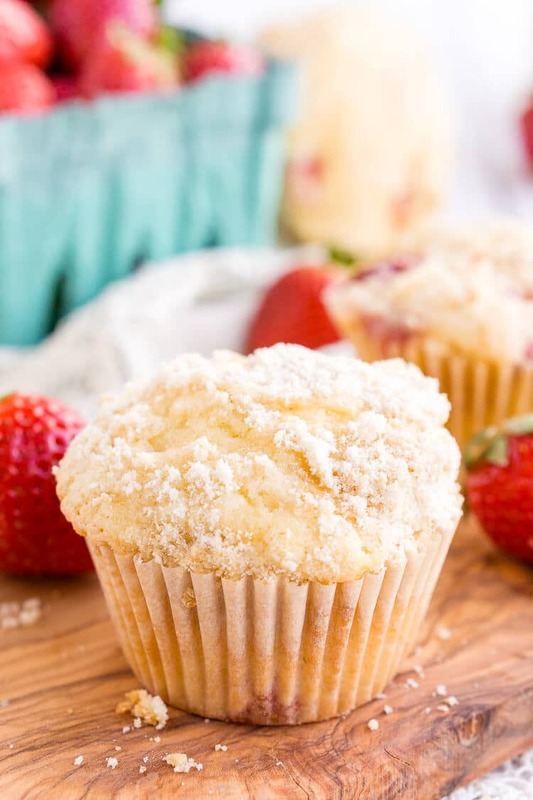 These Strawberry Coffee Cake Muffins are made with sweet fresh berries and buttermilk and topped with a delicious sugar and butter crumble! 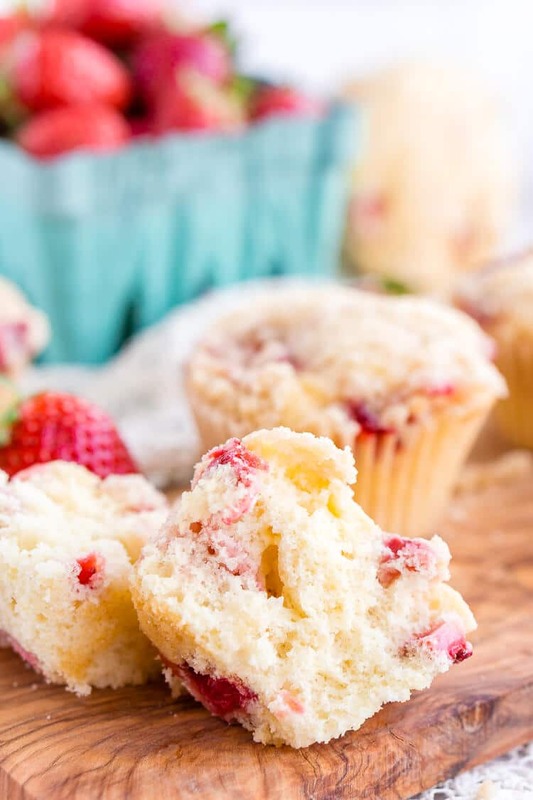 These Strawberry Coffee Cake Muffins are the best muffin recipe around and will be an instant favorite with the fam! Is there anything better than fresh local berries? I think not. Except baking with them, that’s pretty good too! A couple of weeks ago I went with my mom to scoop up some of the last strawberries of summer. An hours worth of work yielded 6 quarts of beautiful and ripe berries. Ripe Summer Strawberries Are Perfect For Baking! Usually, there isn’t a lot of time to work with when it comes to freshly picked berries in the heat of summer, so I knew I needed to work fast. I froze a little more than 5 quarts and chopped up the rest to make these delicious Strawberry Coffee Cake Muffins. I’ve always loved coffee cake, there’s just something about that sweet crumbly topping and the slight dryness of the cake, perfect to pair with your morning cup of coffee. I knew this muffin recipe would be perfect breakfast for our Kiwanis Club as we met up on Sunday morning and started preparing for our local carnival. Buy My Favorite Muffin Pan! The berries, though baked still remain juicy and sweet and the sugar crumble is just so delicious. You want to make sure to use cold butter as that’s what makes it all crumbly! 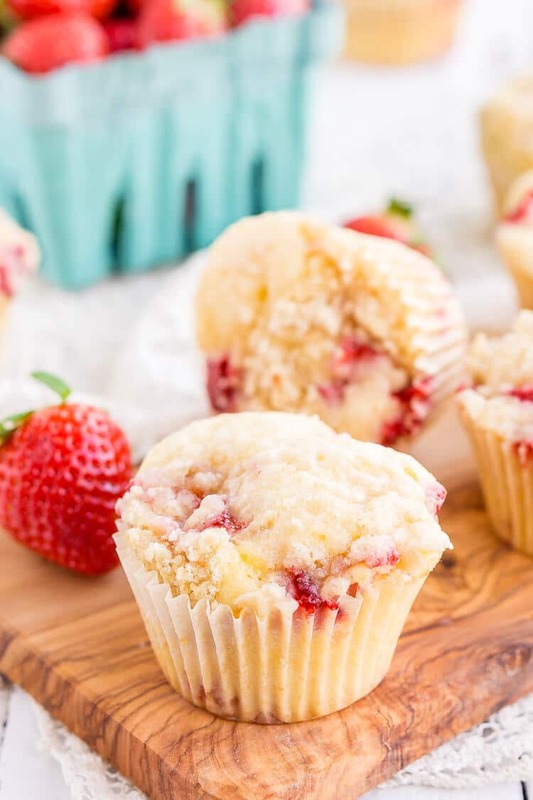 These strawberry muffins are light and fluffy and have just a slight hint of sweetness to them with a vibrant strawberry flavor. They’re best warmed with butter spread on them. Buy My Favorite Muffin Liners! Normally I use my summer berries in desserts like my Blackberry Buttermilk Panna Cotta or in drinks like my Strawberry Daiquiri or, you know, just eat them straight. You can also make really easy fillings or simple syrups if you’re looking to use your berries up quick! The nice thing about this muffin recipe is that you can use any berry your fancy or even do a mixed berry topping, now doesn’t that sound good? Blueberry and Blackberry season is right around the corner here in Maine, so stayed tuned for more delicious berry recipes! 1. You can either mix half of the strawberries into the batter and add half to the top, which will result in flatter muffins. Or you can mix all of the strawberries into the batter which will yield dome topped muffins. 2. 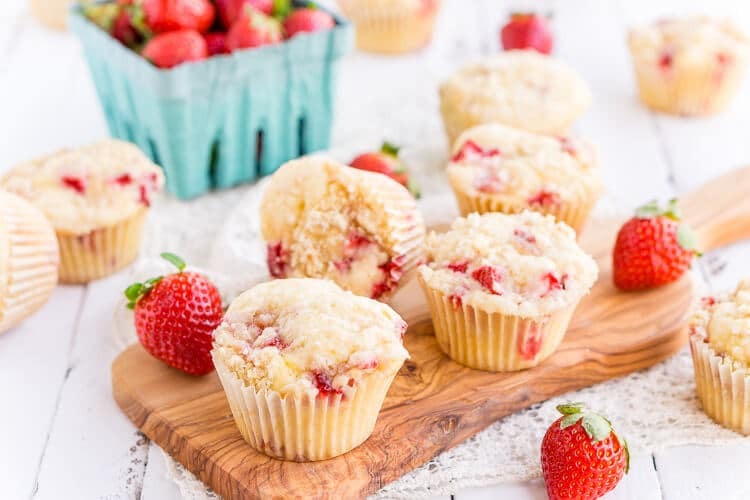 Fresh Strawberries should always be used for this recipe, frozen strawberries have too much additional water/juice in them and this will result in soggy/sunken muffins. 3. Buttermilk is a MUST! Buttermilk and other kinds of milk have different acid levels and react differently with the leavening agent and sugars used. If you don’t have buttermilk, you make a substitute yourself following the steps below! Use a small fresh lemon or white vinegar. Stir in 1 tablespoon of lemon juice OR vinegar into the bowl with the milk and whisk to combine. Viola! You have buttermilk! This post was last updated February 2, 2018. 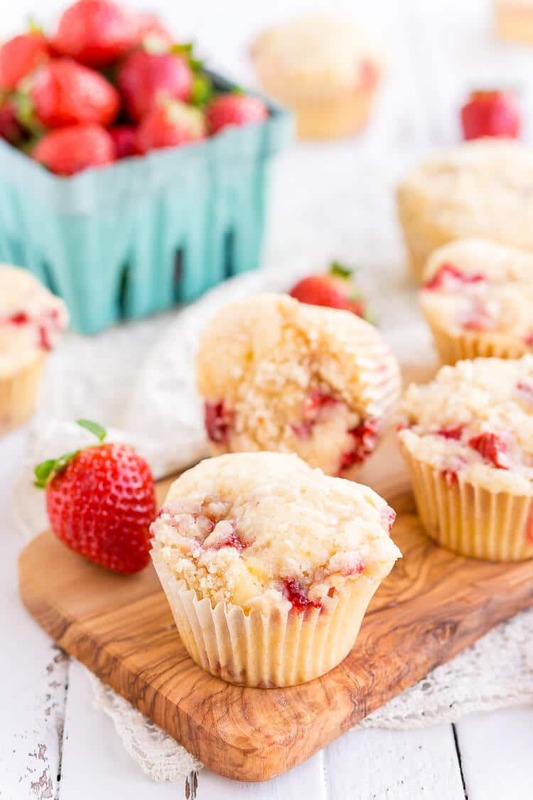 These Strawberry Coffee Cake Muffins are made with sweet fresh berries and buttermilk and topped with a delicious sugar and butter crumble! 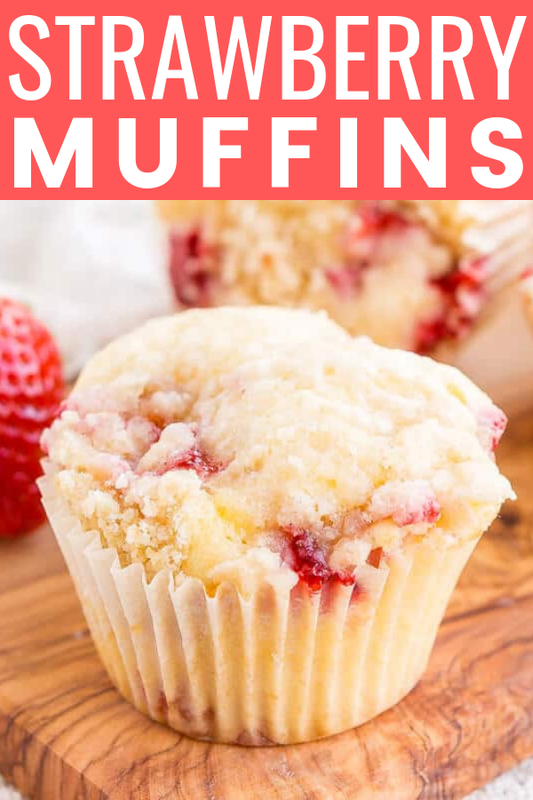 They're super easy to make and readers have called them the best muffin recipe they've ever had! Beat in egg and vanilla. The mixture will be a bit lumpy, that's okay. Slowly add buttermilk and flour mix, alternating between until incorporated in the butter mix. Gently fold in about half OR ALL of the strawberries. See notes. Add about 1/4 cup of batter to each muffin liner. 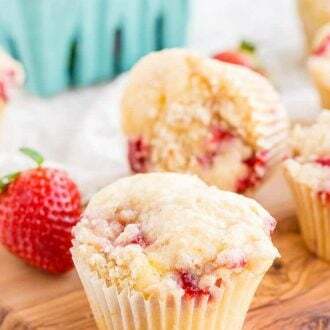 Load up the tops of the muffins with remaining strawberries. In a mixing bowl, beat crumble ingredients until it looks like, well... a crumble. 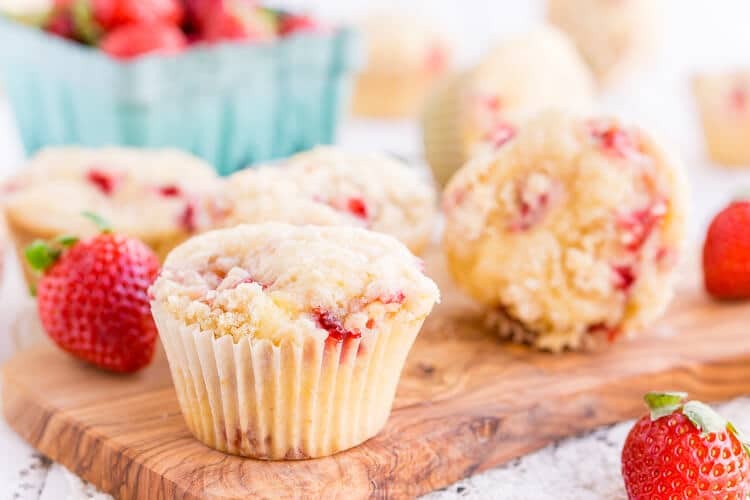 Reduce oven heat to 350 F.
You can either mix half of the strawberries into the batter and add half to the top, which will result in flatter muffins. Or you can mix all of the strawberries into the batter which will yield dome topped muffins. Best consumed within two days. You muffins look amazing that I wanted to make this for my daughter’s birthday treat. May I know what kind of flour do you use? Unbleached wheat flour or superfine/cake flour? Hi Ira, I use King Arthur’s all-purpose flour. Hi, can you use jelly/jam instead of using fresh berries? I’m looking for recipes where I can use the substitution. Hi Christina, I’ve never tried it myself so I can’t say for sure, but maybe try swirling it in on top. These are good, but a bit sweet for our taste. Despite using a light coloured muffin pan, the bottoms got a bit dark. Next time I will preheat the oven to 350. I used buttermilk. It made 14 muffins with the yellow scoop. I think blueberries or another fruit would also work well in these muffins. , but oh so good. These were very tasty. My family liked them. Can I substitute buttermilk for regular milk? Hi Melissa, buttermilk and regular milk have different acidity levels that impact the leavening agent and how the muffins bake. I’ve always used buttermilk, you could try regular milk but I’m not sure how it will turn out. You can also make homemade buttermilk, if you google search it should give you the recipe, I think it’s either milk and lemon juice or milk and vinegar. I never make muffins because they never come out good. I decided to make these tonight because i had alot of strawberries. These came out amazing. They are ao good I dont want to eat them. I just want to save them forever. Thank you so much. I plan on making them again but with blue berries. I’m definitely putting your recipe in my book of favorite recipes! I’m so glad you loved them, Danielle! I’m planning a blueberry version in the next couple weeks here on the blog! This is my go to muffin recipe. I’ve also made them with raspberries and blueberries, delicious! What can you replace buttermilk with? Some have used milk but just note that it will react a bit differently because of the acid difference. Today is February 27, 2018 and it’s been very cold (for Southern California weather), it also rained a couple times. With that said, the original dinner plan changed to a chicken soup with something warm for dessert (I hadn’t figured that part out, yet). I had some strawberries that I felt needed to be used so I went on Pinterest, needless to say your recipe is the one that captured my interest. We (my little helpers, 6 and 7 years old and I) tried it and we’re so pleased; they are SO yummy! Thank you for sharing! This is definitely something that you can make anytime of day. These muffins warmed us up on this chilly night (51 degrees Fahrenheit 😆). I’m so glad you all enjoyed them and they warmed you up! That’s one of the things I love about this recipe is that it’s great for any weather!